Lot 246. A fine and large famille rose 'hundred deer' vase, hu, Late Qing dynasty, Qianlong seal mark; 43.5cm high. Estimate HK$700,000 - 900,000. Sold for HK$ 875,000 (€ 92,298). © Bonhams 2001-2013. The bulbous body with gently rising shoulder, flanked at the sides with a pair of gilt chidragon handles, the exterior finely painted with a continuous landscape scene of deer decorated in white, beige and brown enamels engaging in various activities, including grazing and prancing in open fields, crossing streams, lying down, and stags competing in courtship of does, all set in a lush mountainscape with pine trees, fruiting peach plants, and lingzhi, the base with a six-character zhuanshu seal mark in underglazed-blue. Note: The current lot is richly decorated with the auspicious 'hundred deer' motif. The word 'deer' translates as lu and the peaches represent longevity or shou; together they form the auspicious pun lushou which literally means 'fortune and longevity'. Furthermore, the large bulbous vessel with wide waist suggests generosity and abundance of wealth; the precious lingzhi within the scenery, which has medicinal properties, also represents long life. 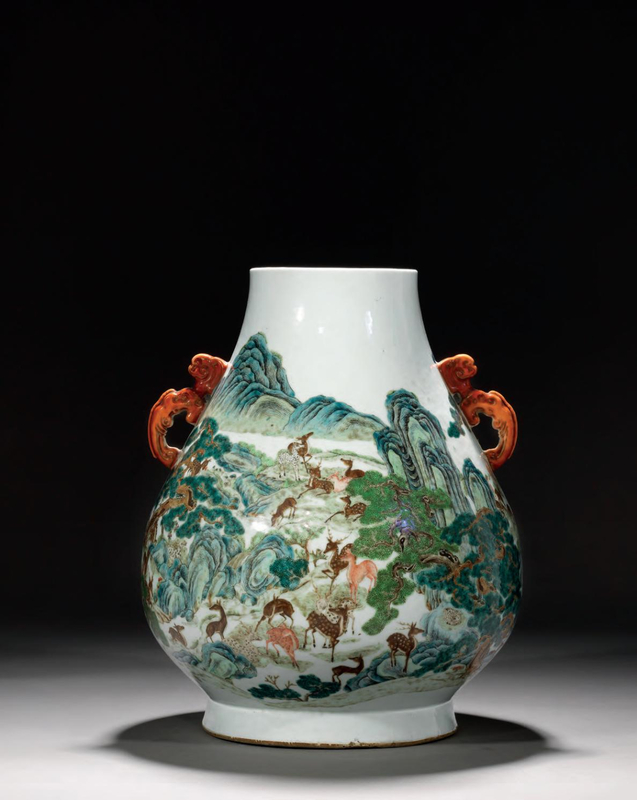 For further reference, see a pair of 'hundred deer' vases dated to the Qianlong period in the National Palace Museum, Taipei, illustrated in Stunning Decorative Porcelain from the Ch'ien-lung Reign, Taipei, 2008, pp.156-157, no.51. 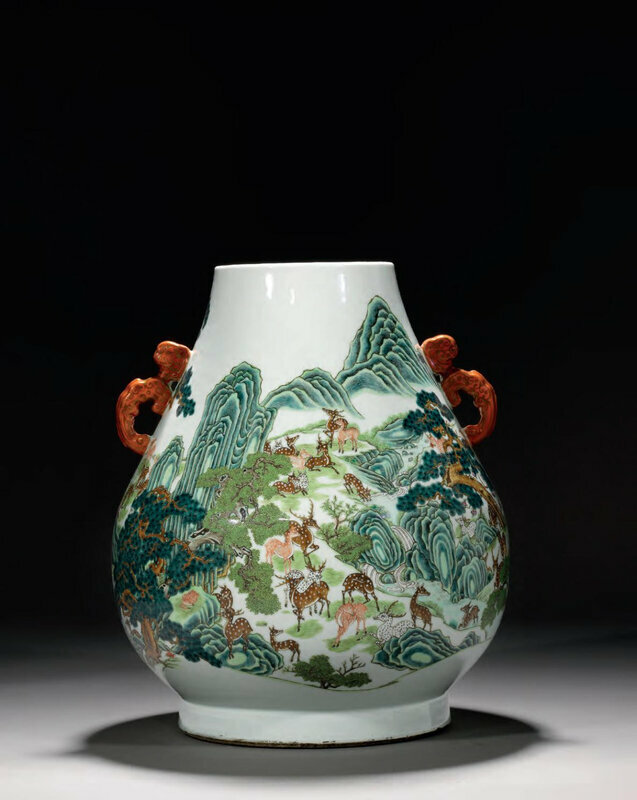 Another 'hundred deer' vase in the Nanjing Museum, Nanjing, is illustrated in Treasures in the Royalty. 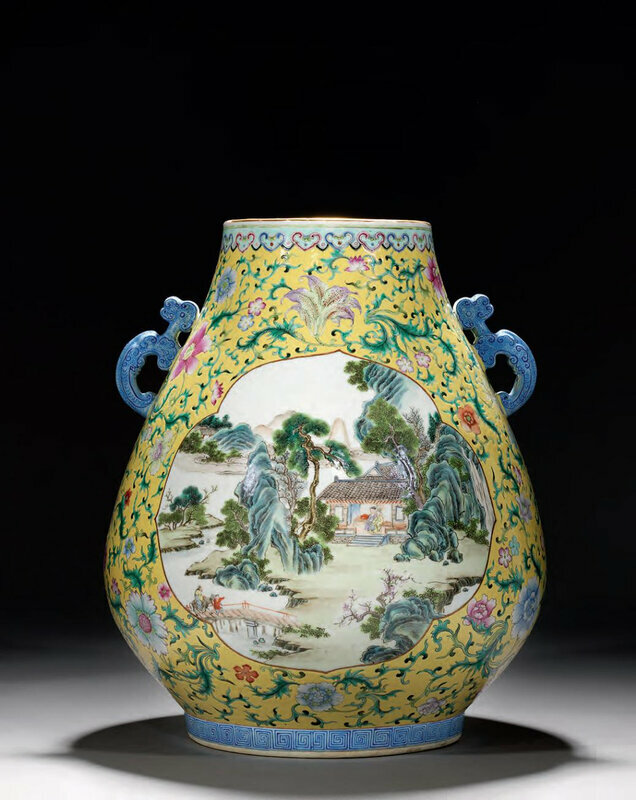 The Official Kiln Porcelain of the Chinese Qing Dynasty, Shanghai, 2003, p.290.